Black Mesa, or Big Mountain, is an area of traditional Diné territory in so-called Arizona where families have been resisting forced relocation for a generation. Diné elders in Black Mesa have reached out to us with a call for support and solidarity. Together with Diné Land and Water, we will repair leaky roofs, replace windows and doors, chop and distribute wood so no elders are without heat, and distribute water and food. 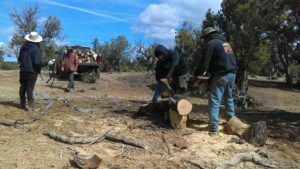 Earlier this winter, a group of us from Peaceful Uprising went to Black Mesa to join Diné Land and Water in chopping and hauling 40 trucks of wood for numerous families. We reached about half of the families, and we also helped fix up the roof of a hogan (a traditional home). But the need is ongoing. 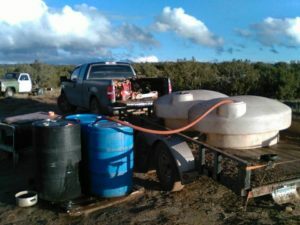 In February, we plan to go to Black Mesa to continue working with Diné Land and Water to repair leaky roofs and replace windows and doors. Many houses need repairs—like roof repairs, new doors, and windows—so the elders and families will have adequate housing. We’ll also be chopping and distributing wood to the families. Many of the people who live there are now elders, and support is crucial to ensure they can continue their way of life. Their lives are resistance—their very presence there helps prevent Peabody Coal from expanding further into their territory. Because they live in a disputed territory, they lack electricity and running water—yet these families refuse to abandon their ancestral homeland. Please join us in supporting the community of Black Mesa this season. 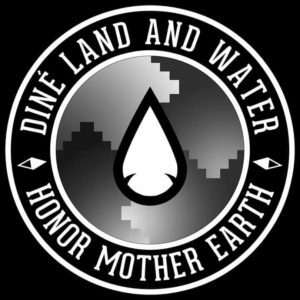 Diné Land and Water is a grassroots organization based inside the Navajo Nation reservation. It’s composed totally of Diné (Navajo) land defenders. The group started about a year ago, with a goal of supporting the causes of greatest need inside the reservation. Since then, Peaceful Uprising has been working to support Diné Land and Water in answering the call of the elders of Black Mesa for solidarity in the way of wood distribution, water hauling, food, sheep herding, and being prepared to serve as human rights witnesses in case of attempts to impound livestock, as elders live under constant threat of having their livestock seized. Elders have literally been terrorized by government agents seeking to clear the way for coal and uranium companies to move further into Diné territory for decades. 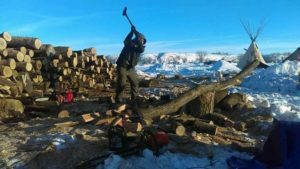 Your donation will provide us with the funding to buy the materials that we need to fix many houses, as well as to get the tools that we need to keep chopping and hauling wood, like chain saws and axes. This will also help with transportation for Diné organizers who need to travel to a particular area of the reservation to engage in order to collaborate and connect with one another. The work itself is also bringing organizers together, lending the chance to engage in deep conversation with the community. Please give what you can to support the families of Black Mesa in their steadfast resistance to relocation. Their presence on the land is bravely defending the planet that we all depend on! Please contribute to this effort here!